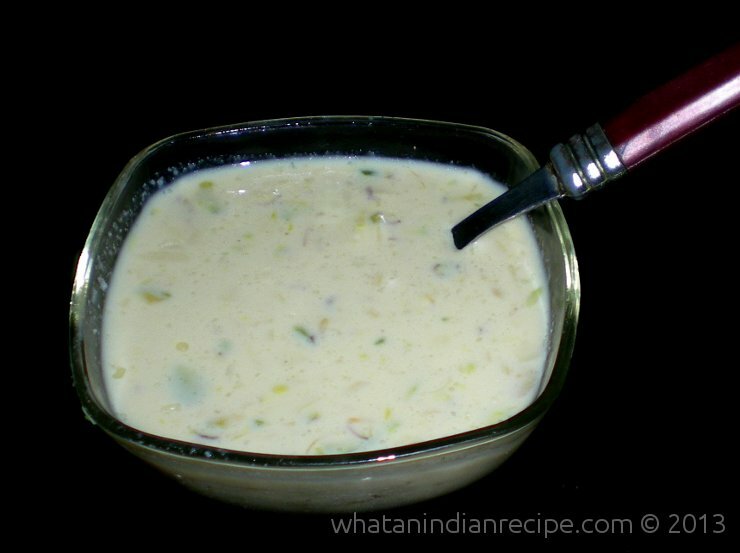 You may substitute condensed milk with khoya, and add dry fruits as per your taste to get it made to your liking. Boil milk and stir with a large spoon continuously. Add sugar and boil for another 10 minutes. Now add kesar, kaju, badam and pista, heat in a low flame until it becomes half in quantity. Add milk maid to it and stir continuously. Mean while put ghee in a pan. Add vermicelli and fry till it becomes golden brown. Put this in to sewaiyan and remove from heat. After an hour or so when it cools down add raisin to it because if raisins are added in hot milk it will curdle. Serve hot or cold with puri.